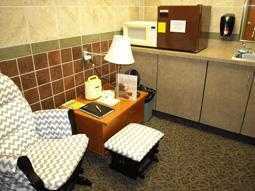 Ohio University has a lactation room on the Athens Campus, John Calhoun Baker University Center in Room 353. It provides a Medela Symphony Plus Pump for moms who need the electric type. Parents who want to use the hospital-grade, multi-user pump must bring their own attachments. Other amenities include soft lighting, a microwave, mini fridge to store breast milk, a comfortable padded chair and ottoman, a sink, tissues, table with reading material, and disposal bin. The microwaves are there for sterilization.